Greater Manchester’s academic health science and innovation system, Health Innovation Manchester, is celebrating its first anniversary since officially launching and setting out its vision to be an international leader in accelerating innovation to transform health and wellbeing. Health Innovation Manchester (HInM) launched on 2 October 2017, merging the research, education and clinical excellence of the Manchester Academic Health Science Centre (MAHSC) with the adoption and diffusion expertise and infrastructure of the Greater Manchester Academic Health Science Network (GM AHSN) under a single umbrella. At its launch, HInM took on a pivotal role in realising Greater Manchester’s ambition to be one of the best places in the world to grow up, get on and grow old. By bringing together the expertise of our Universities, NHS, social care and industry partners within a devolved health and social care system, we have worked to drive innovation to improve standards and capability of the entire health and care system, with the first year seeing a variety of successes and challenges. HInM has been at the centre of major announcements and achievements, including NHS England awarding Greater Manchester “Local Health and Care Record Exemplar (LHCRE) status to implement a shared care record and plans to create a world-leading precision medicine campus at Manchester University Foundation Trust with industry partner QIAGEN. Partnership working has also be integral to some of our successes during our first year of operation, including the launch of three innovative programmes on COPD, Mental Health and the elimination of Hepatitis C in Greater Manchester as part of our unique agreement between the Association of the British Pharmaceutical Industry. Dementia is also high on the list of priorities for the organisation, with a pioneering partnership between Greater Manchester and the Dementia Industry Group confirmed, designed to focus on developing new medications and technology to improve dementia care. It is thought to be the first partnership of its kind in the UK. Our work with NICE and The University of Manchester is also set to continue following a renewal of shared commitment to improving health through the development of new technology. Projects taking place within HInM have also made significant progress and are making a difference to patients, with 17 projects currently underway in Greater Manchester and 21 live nationally as part of a adoption and spread programme. Life-saving mobile heart monitors have also been rolled out in the region and have already detected 50 people who may have Atrial Fibrillation, an irregular heart rhythm and common contributing factor for stroke. The Greater Manchester and Eastern Cheshire Patient Safety Collaborative are developing thriving learning systems across their workstreams to embrace and harnesses innovation and maximizes improvements in patent safety. Meanwhile our UM team were finalists at the HSJ Value in Healthcare award for their “100% Challenge” work, a unique approach to enable local health systems to work collaboratively, creating tactical and operational solutions to improve care and efficiency. Our work with SMEs in the region is also prioritising innovations needed within GM, including clinical pilots of devices to improve outcomes for patients. A new mobile application to support ambulance staff in ensuring suspected stroke patients are taken to the best site as quickly as possible has been tested by North West Ambulance Service (NWAS) after the idea was pitched at Health Innovation Manchester’s “Mobilise the NHS” scheme bringing clinicians and digital companies together to design problem-solving innovations. Similarly Manchester-based med-tech company Microbiosensor have successfully piloted their PD Safe device, with acts as an early warning system for peritonitis – a potentially fatal infection – following support and funding from HInM. Ben Bridgewater, Chief Executive of Health Innovation Manchester, said: “The first year of Health Innovation Manchester has been incredibly exciting with ground-breaking achievements and partnership working making a difference to Greater Manchester’s health and social care sector. “At the heart of all our work is a drive to improve the health and wellbeing of our 2.8 million citizens and I am delighted that our programmes and innovations are already having an impact on their lives. “Of course none of this would have been possible without the incredible hard work, shared vision and extreme collaboration between our partners and provides, industry and academia and of course our staff. 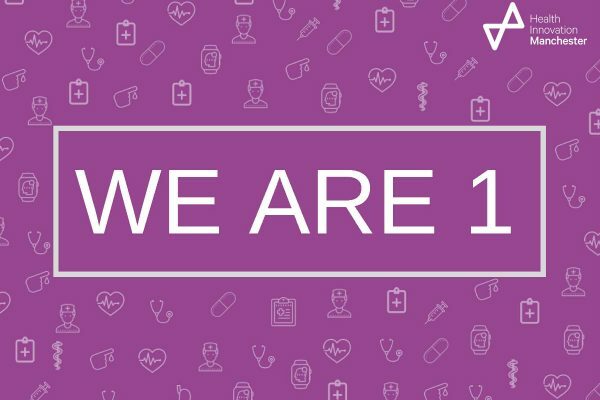 Watch out for Health Innovation Manchester anniversary celebrations taking place throughout the month of October to mark the occasion.